Classroom & Hands-On Riding Exercise Program which introduces and practices the physical and mental skills necessary to ride a motorcycle. On-line eCourse - After registering for the BRC, you will receive information on enrolling for the Motorcycle Safety Foundation (MSF) Online eCourse. You must enroll in and successfully complete the eCourse within 30 days of your actual course date. Your Certificate of Completion must be brought to the first day of class. The eCourse can be completed in approx. 3 hours and consists of 12 Sections. At the end of each Section, a Knowledge Test is administered where an 80% passing score is required to move on to the next session. Classroom – Sessions using small work groups with facilitated, interactive learning activities focusing on perception development and situational awareness. At the end of Classroom Session 2, the Knowledge Test is administered. A passing score of 80% is required. Hands-on Riding Exercises – Day 1 – approximately 5 hours. Each Range Exercise has a specific objective(s) that must be achieved to continue. Hands-on Riding Exercises – Day 2 – approximately 5 hours. 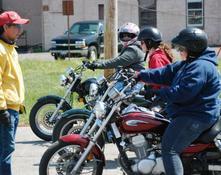 At the end of the Range Activities, the Riding Skill Evaluation is conducted. Completion Card and a Motorcycle Learners Permit (both current and valid) are required to be eligible for the Road Test Waiver Option and both are presented at a DMV office with a current, valid Driver’s License for the Motorcycle License upgrade.  ATTEND all sessions, Classroom and Riding! Arrive on time and be prepared! Jeans: Denim or other sturdy material—NO HOLES & NO FLARE-LEG!! Rain Gear: Classes run rain or shine, change of cloths if no rain gear. Students under the age of 18 must have parent or guardian accompany them to the first session to sign legal waiver. If this is not possible, call 518 562-8675 to make other arrangements. Call for more information regarding Junior Licensing. Be punctual: If you are late due to any excuse (traffic, faulty alarm, car trouble etc.) you will not be able to continue the course (There is NO rescheduling or refunds due to your being late). 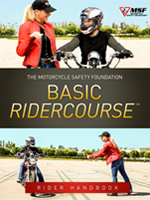 In the eCourse: you will learn what to wear for comfort and protection, how to create your own strategy for riding in traffic, dealing with critical situations, how alcohol and drugs affect your riding ability and more. In the Classroom: Our trained RiderCoaches will help you explore your personal driving tendencies, how the eyes and the mind work and other factors for increasing safety. On the range: The course begins with the fundamental skills of straight-line riding, turning, shifting and stopping. After practicing the basics, we will gradually progress to more advanced cornering, swerving and emergency stopping. Over-the-ankle boots, long pants, long-sleeved shirt or jacket, full-fingered gloves and DOT approved helmet. If you do not own a helmet, one can be provided. Be prepared for all weather conditions, such as rain, hot or cold weather. *In cold weather conditions, students should wear layers of clothing. We ride rain or shine!!! The BRC is mentally and physically demanding. Please be sure that you are well rested and free from any distractions during your course. For your safety and the safety of others, please disclose any medical condition you may have that could interfere with your ability to ride/push a motorcycle. If you are taking any medication, please consult with your doctor or pharmacist to confirm that there will be no conflict. Some prescription and non-prescription medications may cause drowsiness and/or affect your balance. Immediately after you pass the motorcycle course you will receive a completion card from the NYSMSP and the Motorcycle Safety Foundation. The Card must be taken to the DMV office to have the M added to your license. (A) 16 years old. Students under 18 years old will have junior restrictions on their- motorcycle license and their parents must sign a waiver to participate. Phone for details. -(Q) Do I get my license by taking this class? (A) Two day class (8am~6pm). Plus the online E Course taken within thirty days of the class start date. The E-course takes 3+ hours to complete. (A) For most students, yes. The range portion begins with hands-on learning the location and function of all of the controls, proper mounting and dismounting techniques, proper start up and shut down procedures. (A) No , We will supply a handbook to you. If you would like to read through it ahead of time, click HERE. (A) Yes, in almost all cases, we have a proper bike. If you are VERY short, phone 518 562-8675 to discuss. If you plan on bringing your own bike, please call 518 562-8675. (A) Yes, call 518 562-8675 for specifics. (Q) Does the BRC qualify for insurance discounts? (A) You will get wet! We ride rain or shine. Bring a rain suit. (A) Phone 518 562-8675 to discuss. alternative to the DMV road-test.